7 Comments for "Un-beet-able Berry Smoothie"
This is one of my favorites to make with kids because many kids are skeptical about beets at first, but then they love the recipe when they try it! One issue I've found when making this recipe is that the only canned beets I can find have salt added. I recently made it with fresh beets that I boiled to soften them, and that seemed to be a bigger hit than when we made it with canned beets. The beets found in refrigerator packs may work better if they are unsalted. All in all, I love this recipe. The color is beautiful and it's a great way to add the nutritional benefits of beets into our diets! I made this smoothie up for 5 different classes at an elementary school. I set the scene by telling the students that there is a total of 5 ingredients used to create the smoothie that represent 3 food groups. I explained I wanted them to take their time sampling the smoothie and really try to figure out what each flavor was and from what food group. I did this to help ensure the kids were not prejudice against the smoothie before trying the sample. 85% of the kids enjoyed the smoothie and were not bothered about beets being a ingredient after trying it. In fact, one student was just amazed how much she enjoyed the smoothie because beets alone she can not stand! I am so excited to try this recipe! I love beets! 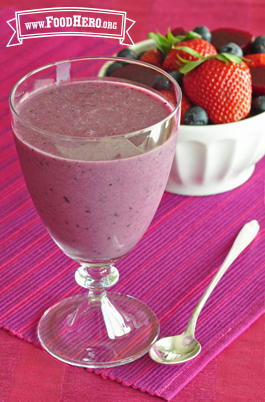 This is one of my favorite smoothie recipes, and I love that it has fruit AND veggies! What a fun way to eat beets! This recipe is very sweet. My kids say it tastes like jelly. They have no clue we put beets in there. You can also use fresh beets that add a really interesting "earthy" flavor. Family not crazy about beets? Just add a small ripe banana and two ice cubes. Serve and ask them to name the ingredients. They will NEVER guess the beets! We have added this recipe to our Morning Smoothie line-up!